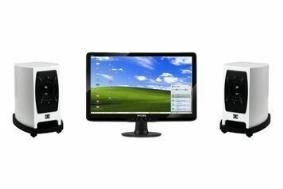 BRISTOL SHOW 2011: Win a XTZ HM800 DSP desktop speaker system worth £390! | What Hi-Fi? BRISTOL SHOW 2011: Win a XTZ HM800 DSP desktop speaker system worth £390! Worth £390, you can be in with a chance of winning this intriguing system by visiting room 230 at the Bristol Sound & Vision Show this weekend. Fresh from CES in America, XTZ is making its first appearance at the Bristol Show with the European launch of its HM800 DSP multimedia speaker system, developed in conjunction with Dirac Research. The two-way speakers hook up to a a 2 x 40W amplifier housed in an aluminium enclosure, which has headphone and subwoofer connections. Just leave your name and details with one of the company's staff in the room, and the lucky winner will be drawn from all the entries on Sunday (February 27th) at 4.45pm by XTZ's founder and chief designer Olle Eliasson. There are also lots more prizes to be won in the main £10,000 show competition. And to find out what else you can see at this year's Bristol Show, see our special blog.